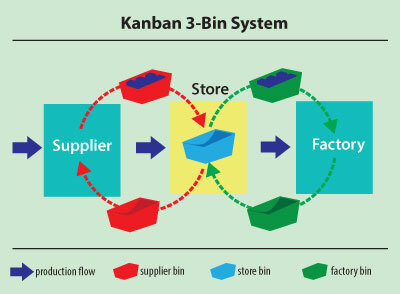 Kanban is a Lean production technique whose primary objective is to maximize delivery of value to customers through continuous and fast quality output. The approach is ideal for those organizations that find themselves juggling many tasks without concentrating on any of them. Additionally, those firms face chaos at each step, wasting time and resources as a result. The method allows an organization to visualize its process. Consequently, companies will defy the odds and achieve their business goals easily. Kanban has been proven to be useful in all business functions. Remember, every organization aims to improve the quality of the output, lead time, and the overall throughput. Kanban helps businesses achieve all these desirable aspects. Efficiency at work is a necessity for any successful business. Organizations may be familiar with Lean, the process of identifying waste and looking for ways to eliminate it. The kanban method is one of the useful tools of Lean methodology that ensures that an organization’s performance is at par. Lean tools can be used to solve a variety of problems; they are adaptable and can be modified to fit the problem at hand. For instance, kanban is used to deal with bottlenecks and chaos at work. Kanban aims to help organizations understand how to get the best results from a given project. The method provides a clear mental picture of the project process. It guides a user through the whole process right from start to completion. Understanding the functioning of the workflow is a sure way to have the job done perfectly. It inspires people to make adjustments to projects so that they move in the right direction. More often than not, individuals who make changes to their plans before understanding the workflow end up making irrational or unhelpful decisions. That isn’t rewarding at all. Visualization helps people know their projects well and keep them focused on each and every task. For instance, visualizing a workflow by using graphical process models can help a group know where it is performing well and where it needs to improve. Graphical models can be modified to represent different stages of a project, and this will help monitor the workflow systematically. Moreover, visualizing work helps identify the market risks that may spell doom to a project. Teams can predict the market spoilers, differentiators, cost reducers, and table stakes. There is no fixed workflow procedure to be followed; each business has its unique workflow depending on the nature of that business. Group content: List all the assets needed to make a project a success. That will help people gauge the amount of labor required, funds, and necessary steps that will see it through. Draw the process: Take a marker and a whiteboard and draw the resources needed, the people required, the steps involved and everything that may be handy in the form of a drawing. From the drawing, look for the best ways to make what seems implicit to be explicit. As a result, what seemed complex will become easy. Simplify the workflow: People can now customize their workflows to match their needs. A simple workflow is easy to execute compared to complex workflows. The success of kanban revolves around the WIP. The implication here is that the workflow is limited in one stage and pushed to the next level where it can be accommodated without causing problems. It makes a lot of sense to deal with a small number of tasks at each stage rather than juggling them all together. Splitting tasks into small sections will help people concentrate on each and will maximize the output as a result. Users will identify problems quickly and solve them at the appropriate time. During the initial stages, knowing the WIP for different processes and tasks may not be easy. However, people can make a guess of where to start because they must start somewhere. Setting low initial limits yields faster results compared to starting with high limits and many tasks. Setting limits that teammates or workers are willing to enforce is another important facet. Low limits reduce the time taken to perform a specific task and improve the quality of output. Consequently, it leads to an increase in efficiency because the faster achievement of objectives acts as the driving force. Performing numerous tasks concurrently leads to a lot of imperfections, which may require much reworking, hence a lot of wasted time. Teams should be aware of these benefits and that, as a result, will prevent their patience from running thin. The WIP constraints ensure that work remains in one step until it is complete or there is an open space in the next step. Although this practice is robust and guarantees optimal results, it faces resistance too often, and many businesses overlook it. They think performing many tasks at a time is the most productive practice only to be frustrated by the end results. Summarily, WIP limits create some sense of discipline among employees. People learn to give a single task all the concentration needed. Consequently, the productivity of the organization is taken to the next level. All businesses implement kanban systems to achieve a positive and desirable change. However, they cannot change what they don’t already know. First of all, people need to know what is supposed to be changed before they implement that change. The flow of value can help people know what to change – monitor the flow of value in a system, analyze drawbacks, and finally implement the desired changes. Once those changes are applied, it is useful to examine the impact the change has on a system. Does it increase the productivity of the firm in any way? Is the change positive or negative? What is the effect of the change on the customer side? Usually, a significant improvement in one stage promotes good performance in the next stage. That implies that you will start going up the success ladder one step after another. The flow aims to optimize both speed and the quality of the output simultaneously. These two metrics ensures that a firm achieves top-notch results within the shortest time possible. The firm will know the time taken to complete a given task, and this will help determine what time to allocate for different tasks. That will consequently minimize wasted time. A control chart or cumulative flow diagram can be used to measure workflow. This can also be measured by hand because it is not that complex. For easy measurement and calculation of the metrics, businesses can use any robust measurement tool. As stated earlier, it’s important to understand everything to achieve goals quickly. It is impossible to improve things that aren’t understood yet. All the process policies must be followed explicitly. When everyone knows how work is done and how things work, they can make rational decisions that will steer a project in the desired direction – all choices made will be empirical and result oriented. For instance, someone could make the definition of “done” explicit. What is meant by the definition of “done”? Set certain criteria that an item must meet before it moves to the next step. Some tools such as electronic and manual boards can help accomplish this. When using kanban, organizations will come across “kaizen,” a term that means progressive and continuous improvement. It’s possible to observe the kanban methodology to the letter, yet fail to achieve sustained growth. Kaizen can prevent this from happening. Once everyone understands the workflow, the risk involved, and the theories about work, a team can build a collective understanding of problems and formulate changes that everyone can agree to. Models and scientific methods are used to implement evolutionary and incremental changes. A. Theory of Constraints (TOC): This management paradigm is concerned with the study of drawbacks and bottlenecks, which may deter the fast growth of a firm. The theory uses an explicit approach to identify all possible constraints and restructuring the organization to handle them. If there is one constraint, it should not be overlooked because it may adversely affect other processes in the long run. Identify all the restrictions in the system. Formulate a strategy to exploit those constraints. Return to step one if the constraints have been broken. Note: A constraint is said to be broken if it has been dealt with efficiently and it no longer affects the overall throughput of a project or system. Appreciation: Understand all processes that involve producers and the entire customer base. Theory of knowledge: This concept helps people to choose what to know and what not to. Knowledge of psychology: It deals with all the concepts that involve human nature. Knowledge of variation: It explains what causes variations as far as quality and application of sampling in measurements are concerned. C. Lean economic concept: This explains all the concepts of waste. It is important to point out the possible wastes in your business and come up with steps to do away with them. It will increase the productivity of your firm. Kanban methodology is so flexible that it is easy to incorporate its properties one by one into a project; there is no prescribed procedure to follow. Therefore, start with what seems simple, relevant, and understandable. The kanban method is only effective for those individuals or organizations that are ready to implement change to the existing management systems. It requires minimal resistance. However, it’s unwise to start with sweeping changes. Small incremental changes are recommended. Usually, systems that are not ready to accept change are vulnerable to breakdown or poor performance. They cannot rise above the competing brands, and they will remain underdogs forever. The kanban method recognizes that the existing processes, titles, and roles may be invaluable. There may be some parts in a project that are performing incredibly well. These parts should be maintained or have some value added to them. As much as kanban encourages change, it does not mean that the whole system needs to be changed. Altering the entire process can be overwhelming, and it may not produce the best results. An entire change can lead to both emotional and physical resistance. Change what needs to be changed only. Many methodologies encourage leadership at all levels, and kanban is no exception. This principle helps people understand that leadership can be achieved in many ways; a person doesn’t have to be a director or a CEO to be a leader. Employees can form groups and formulate strategies that they think can improve the performance of the firm. Once they’ve achieved those objectives, they’ll consider themselves leaders. That can give them the driving force to conquer other bottlenecks and deterrents of growth. The kanban methodology originated in Japan in the 1940s. 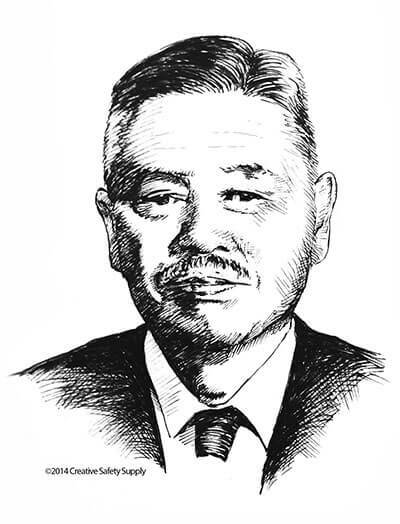 Taiichi Ohno of the Toyota Motor Company observed the way American supermarkets stock only as many products as they need on shelves and then reorder more goods. This led to the idea of producing enough rather than overproducing. However, since people were used to having extra materials on hand even when they had no need for them, they did not buy Ohno’s ideas at once. Eventually, though, most people started subscribing to this school of thought. The company began producing only as many products as were requested by customer demand. Kanban became the system for controlling this type of production. As kanban evolved, signals such as cards were used to carry information and instructions related to production within the company. Finally, Toyota encouraged vendors and producers to adopt the kanban methodology to track their production and inventory, too. Today, kanban cards (or other signals such as bins or electronic messages) are used in many industries. The kanban card is the earliest element of kanban. Warehousing and other production functions use the card to control production and track inventories. In production, the cards are given to the first operators in any process. The card contains the important details about a given order that is being processed. Oftentimes, the cardholder attaches the cards to the container of the production unit and the card remains there until the production process is completed. The main reason for this is to ensure that the customer receives what they are looking for. The card is only removed from the container at the end of the process. 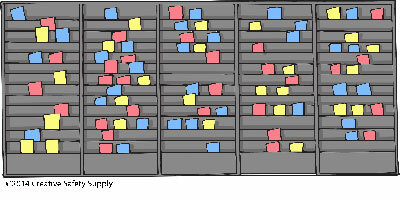 In other kanban systems, different cards are sent between various parts of a process to requests materials or actions. 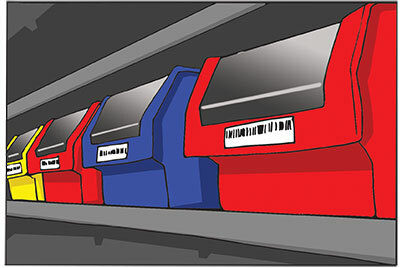 Today, many kanban cards are electronic; these systems use automated databases and barcodes to track inventory and production processes. Electronic cards are often more efficient than manual cards because managers can monitor production right from the comfort of their offices. They only need a stable internet connection and a computer. In ERP systems, manual cards are used as visual reminders. They act as signals that indicate when more production materials are required. A kanban should always be attached to goods. The number of kanban cards should be reduced for optimum efficiency. Always aim at sending products that are 100% defect free. If goods with defects are sent to the next operation, it will lead to a lot of waste and reduce productivity. The quantity indicated at earlier processes by the kanban card guides the later processes. Items should not be transported if a kanban is not attached to them. Only produce parts that are equal to the number of kanban present. Producing more goods than the number of kanban may lead to waste of inventory. Withdrawal Kanban: This kind of kanban authorizes the movement or transportation of parts from one inventory stage to another. It specifies the quantity that a manufacturing process is supposed to withdraw from proceeding processes. 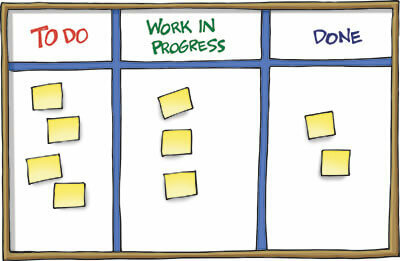 The withdrawal kanban carries the following information: container type, part name, lot size, name of the preceding process, name of the next process, location of the next process, routing process, location of the preceding process, part number, container capacity and number of containers released. Production Kanban: A production kanban issues an order to succeeding stages to create the lot quantity shown on the card. The card usually contains: the amount and type of materials required, the inputs needed in the succeeding stage, and all the information found on the withdrawal kanban. Express Kanban – These are used when there are shortages of parts. Through Kanban – When the work centers are located too close to one another, the production and withdrawal kanban can be combined to form a single kanban. The through kanban makes this process a possibility. Emergency Kanban – Sometimes, defective items may be transported. These kanban are used to replace those parts. The defect may be caused by a variation in production volume or machine failures. Smooth manufacturing flow. With this tool, the production schedule can be met with ease. It focuses on reducing scrap, changeover time of production equipment, and downtime to boost production levels. Easy management of inventory levels. In real life situations, both too much inventory and too little inventory can be hazardous. Too much of it affects the cash flow because the overhead costs of insurance, security, and storage are increased. Too little of it can ruin the reputation of your business because the entire customer base will be dissatisfied because of shortages and low quality. Kanban methodology ensures that inventory levels are kept at the best levels for maximum output. Overproduction elimination: Kanban is a pull system—meaning production is pulled by customer demand rather than pushed by traditional production forecasting—and it can eliminate overproduction with ease. Moreover, the method reduces the risks of inventory obsoleteness. The kanban system helps operators of different products oversee production. The workers are equipped with adequate knowledge about daily operations and workflow. Empowerment reinforces training and education at managerial levels. It generates enthusiasm among the staff, mutual respect, and desire to work towards achieving the objective of the business. Additionally, empowerment discourages absenteeism and boosts productivity. Empowerment works to reduce the resistance from employees, too, because employees are involved directly in decision-making. Achieving production goals is not enough to say that a business is successful. Are goods in demand? Demand for goods is not fixed; it may either increase or decrease. With the help of the kanban method, a business can increase demand responsiveness, and this will mainly reduce wastes, overproduction, and losses. It can detect when demand is building up and guide people through the production process. Businesses will never get stuck when there is a sudden drop or increase in the demand if they have implemented the kanban system. Kanban systems promote an ideal environment for quality improvement. They encourage production of small bits of work at each level of production, which results in quality goods. Handling many tasks at one stage increases the chances of errors and reworking. The system encourages employees and managers to be patient. The result is a well-disciplined team that is dedicated to working towards achieving the goals of the project. The tools of kanban such as cards and bins will stop flowing when a problem in production is detected. It helps the managers identify the problem as soon as possible before a major issue occurs. Consequently, a continuous output will be achieved. These boards usually hang on walls. They are flexible: Physical kanban boards can be customized to meet a team’s needs. Do they want extra columns? Do they want to decorate it? Which materials will be used? Do people want to write on both sides of the cards? They are simple to use: There is no training required to read and interpret the information found on these boards. Everyone involved in a project can understand the messages easily without too much extra clarification. They are visible: Usually, kanban boards are visible from a distance. They don’t work when members of a team are in different places. That means multiple copies must be made so all the members have equal access to the information on the boards. As a result, this may lead to extra expenses. These are web-based kanban boards that help manage workflow and tasks with sticky notes on virtual boards. It allows users to control, visualize, and optimize workflows from their computers. Creates collaboration in a distributed team: If your project involves members who are globally distributed, a virtual board can be handy. It helps all members to have equal access to the information regardless of where they are. High level of customization: Modification of virtual boards is easy compared to physical boards. You can change the structure of the board just by clicking a button. They save space: With an electronic board, running out of wall space will never be a problem. All the notes are stored in the hard disk of your computer, and the transmission is achieved through the internet. It is not visible at all times: If you want to access the information on the virtual board but there is no power, internet connection, or available PC, it will be impossible. Online Kanban vs. Physical Kanban – Which Is the Best? Visualizing work in some way is usually a positive thing. The needs of a project and the distribution of teammates should guide groups when choosing a type of board. In a small office where all the employees are in a single room, a manual board can be handy. An electronic board is best for distributed offices. Misconception: Kanban doesn’t have respect for people. Truth: Kanban is a Lean tool. The primary objective of all Lean tools is to minimize waste and create an ideal environment to improve productivity. Lean and its tools emphasize respect for people. By creating an environment that promotes productive behavior, Lean and kanban value work and the people who do it. Truth: Kanban ensures that the flow of inventory is controlled; it does not limit it. Misconception: Kanban is all about forcing people to work. Truth: The objective of Kanban is to improve productivity and reduce lead time. Without these two metrics, employees cannot increase the output of a business. Nobody is forced to work. Instead, they are made to understand how to work. Rahman, N.A.A., Sharif, S.M. and Esa, M.M., 2013. Lean manufacturing case study with Kanban system implementation. Procedia Economics and Finance, 7, pp.174-180. Sjøberg, D.I., Johnsen, A. and Solberg, J., 2012. Quantifying the effect of using Kanban versus scrum: A case study. Software, IEEE, 29(5), pp.47-53.